GINR is located in Nuuk, the capital of Greenland, with ca. 16.000 inhabitants. GINR actively communicates with users of the environment (fishermen, hunters, and recreational users) and with direct recipients of scientific advice (administrators and politicians). 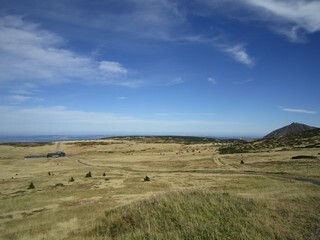 Users of the environment, and their comprehensive knowledge of the natural environment, are included during planning and implementation of the Institute’s activities. Research and monitoring activities focus on living marine resources (fish, shellfish, marine mammals and birds), land-based resources (land mammals and vegetation), as well as physical and chemical processes in the environment in relation to climate change and its impact upon society. 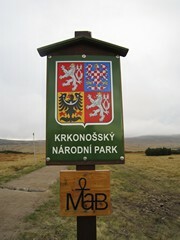 Field work in Kobbefjord was by all means not over yet when I returned from the Czech Republic. Within the following weeks the weather shifted from autumn to winter temperatures, so new pitfalls for collecting arthropods were established (before the soil froze entirely), lake monitoring is almost done for this season with surveys of both our study lakes, and our CO2-flux measurements are done as well. This is due to the low surrounding temperature making it impossible for our equipment to gain the high internal temperature needed for measuring. Our two devices are coated with isolating material, but when the thermometer reaches 0°C or below they are not able to reach +50°C needed for analysis of the amount of C.
The only thing left to do this year in Kobbefjord is a final visist to one of our lakes for a final monitoring. Hopefully it will be done by the end of next week. With this year’s field season almost ending there is nothing much to do but to enjoy the lovely crisp weather and send sunny thoughts to the Krkonose Mountains National Park and their many days with fog 🙂 And of course look forward to the coming year which with any luck will bring lots of eager INTERACT’ers and other scientist to the Greenland Institute of Natural Resources. Work in Kobbefjord has been rather difficult for the past week since autumn along with the “normal” storms and rain has arrived. So we try to push our regular monitoring in between heavy rain and storm with gusts between 25 and 30 m/s. Yesterday was one of those “in-between-days” with perfect weather and snow covered peaks. Due to the rain the water level in the lakes and river systems have risen noticeably. It is nothing out of the ordinary – we are used to having this type of weather in the autumn. But it’s always a bit inconvenient when you know of all the work that still needs to be done. 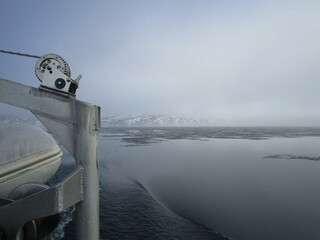 View of the bridge crossing the river in Kobbefjord. 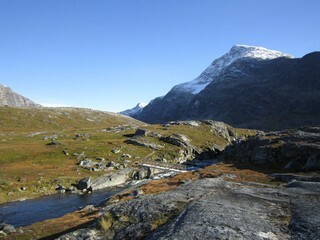 Though I have been complaining about the weather autumn also means fantastic coloration of the landscape. There is hardly anything more spectacular than witnessing the colors change during an Arctic autumn. The shrubs have starting wilting and making the slopes appear orange and red. Especially the red leaves of dwarf birch (Betula nana) stand out – and more so when the canvas is a sunny day with blue skies. 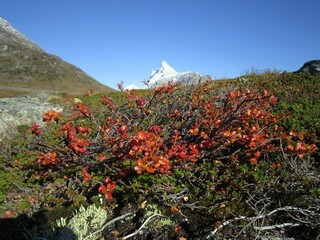 Dwarf birch in autumn colors with the Qassi peak in the background. Today we had plans for bringing a class from the local upper secondary school to Kobbefjord to give them an idea of the monitoring work being carried out. 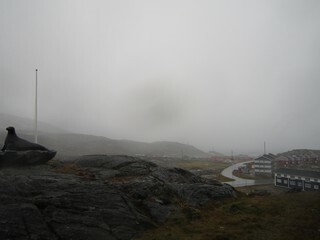 But as the below photo shows the weather has turned really bad again… So instead of them coming to Kobbefjord to learn what scientists do to gain more knowledge on the effects of climate change they have been invited to come to Greenland Institute of Natural Resources instead. I will give them a lecture on what GINR and NuukBasic is all about and hopefully make some of the students interested in pursuing a future within the natural sciences. This is all for now. Next week I’ll be at an INTERACT station managers meeting in the Czech Republic. VIP’s, shrubs and caterpillars… Could you wish for more? 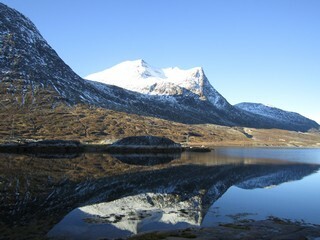 The last couple of weeks have been packed with a variety of activities in Kobbefjord. First, I would like to mention the visit we had by Martin Lidegaard, Danish Minister for Climate, Energy and Buildings and his Greenlandic colleague Jens B. Frederiksen, Greenlandic Minister for Housing, Infrastructure and Transport. They came by in mid August and had a guided tour of the area and were introduced to many aspects of the NuukBasic monitoring programme including among other “why we monitor”, “what we monitor”, “when we monitor” and “how it is all financed”. Martin and Allan with the INTERACT TA-group ATINAO were roaming the hill sides looking for shrubs on the very same day (and several more). They are studying growth of different shrubs and literally went home with a bag full of cut branches for growth ring analysis. It will be very interesting to follow their further studies. They have been visiting several of the INTERACT sites and will hopefully be able to go to new ones next year in their quest of assessing the influence of climate on shrub growth. Mike with the INTERACT TA-group QUANTIC is slaving away in one of the GINR labs. He is measuring e.g. length and width of caterpillars of the moth Eurois occulta. Last year we had an outbreak of them in the areas close to Nuuk and they ate their way through most of the vegetation in Kobbefjord. They were so plentiful that when you put your boot down you could not help but step on several… They were everywhere and the nesting birds were participating in one long and lasting feast. This year we have seen only one! The caterpillars are not only local in their distribution but expanded throughout great parts of the West coast last year. Combined with their extreme fluctuations they are indeed fascinating creatures. 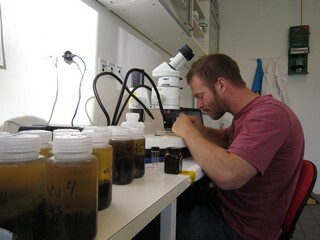 Mike counting and measuring caterpillars in one of the GINR labs. Autumn is around the corner and it can definitely be felt in the air. The temperatures are slowly lowering and the wind is getting more and more chilly. The first snow has been seen on top of the peaks around Nuuk, and though it has melted again summer is only hanging on by the fingernails. 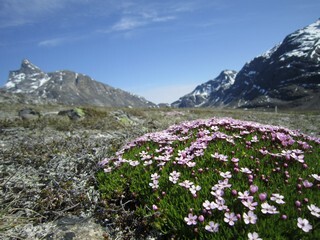 In this blogging post I will shortly describe the Greenland Ecological Monitoring (GEM) programme and the connections to the work being done in Kobbefjord. And off course I’ll give an update on the INTERACT groups visiting since my last blogging. GEM is a programme studying the effects of climate change both in the marine and the terrestrial environment. The long term goal with GEM is to improve our understanding of how climate change affect the different environments in the Arctic. The results will increase our ability to predict how the changes will affect the natural resources – both in the short and long term. 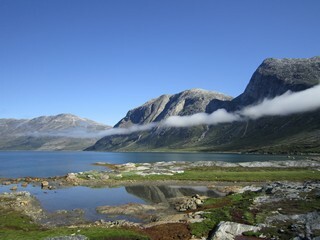 GEM has two research localities: Zackenberg in Northeast Greenland and Kobbefjord next to Nuuk in West Greenland. The scientific concept at the locality in Nuuk is based on experiences from the Zackenberg Basic programme, which was established in 1995. NuukBasic consitsts of four sub-programmes: BioBasis, GeoBasis, ClimateBasis and MarineBasis. I work with BioBasis and will normally go to the field site 2-3 times per week. looking out towards the fiord. Camping in smaller tents in front of the cabin. more wood for the board-walks. 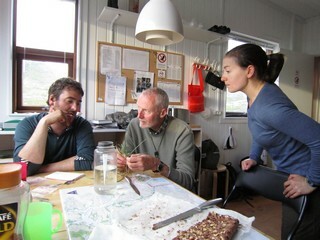 Both Chris, Claire and Ameli have left Kobbefjord and Greenland to venture out on new scientific adventures elsewhere. This coming week we welcome two other INTERACT TA-groups: Mike from the QUANTIC group is among others going to look at catepillers from the Eurois moth; and Allan and Martin from the ATINAO group are studying shrub growth. 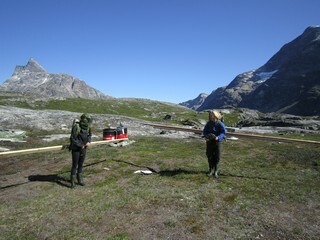 I’m Katrine and I’m co-station manager at the Greenland Institute of Natural Resources (GINR). I will be blogging about the station and our visitors during this summer. 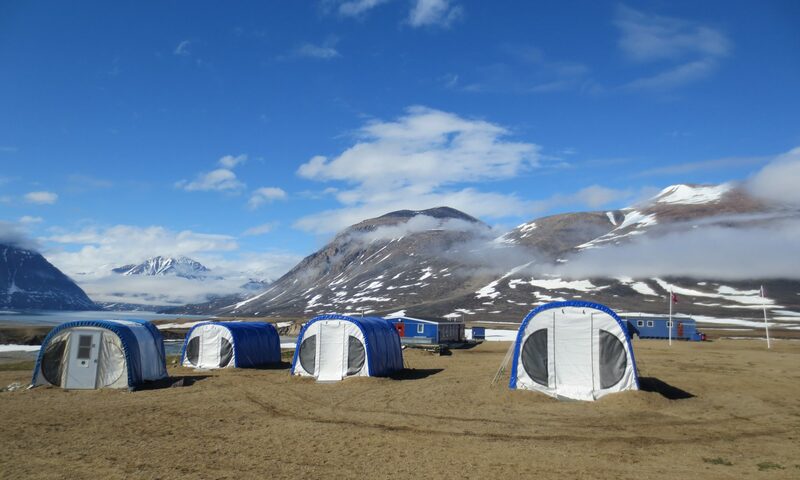 The main focus will be primarily on the work done in Kobbefjord, the INTERACT TA-groups joining us there the next months as well as other researchers coming to the site. When the snow melted everything happened quickly. Several plants started budding within days and rarely have we seen so many flowers as this year. The moss campion cushions turned the otherwise dry and dull looking slopes bright purple. 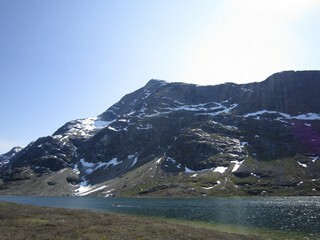 The two lakes we monitor in the area were ice-free and ready for surveys on June 12 and June 22. We have a masters student visiting at the moment and she is studying factors determining the growth of an aquatic plant (intermediate water-starwort, Callitriche hamulata). Researchers in a small dinghy going to their field site. The first INTERACT TA-group has also arrived – the DEFROST group with Christian and Amelie who are going to study the interactions between thawing permafrost and CO2, CH4 and energy exchange. Later today I’m picking up another group – the FRACAS group with Chris and Claire who are going to study functional relationships between Carex species. 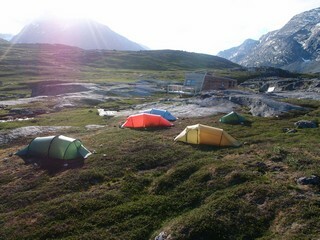 Later this summer to more groups will join us in Kobbefjord. It looks like it is going to be a very interesting summer with lots of great projects in the making. 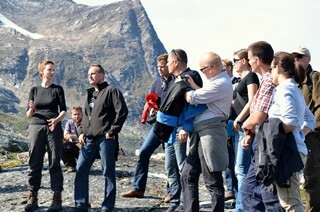 I look forward to keeping you all updated on the work being carried out in Kobbefjord 2012.